The vary of our Copper Couplings & Distributors offered by us are manufactured using advanced process technologies to fulfill the particular method demands together with spinning swaging, compression and crimping. More of contemporary machines conjointly alter us to supply these copper header in minimum tolerance ranges. J Pan Tubular Components Pvt. Ltd.
To meet the variegated specifications of our renowned clients, we are engaged in manufacturing a wide range of Copper Accumulator Header. 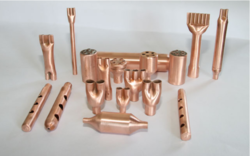 We manufacture Copper Header also known as Copper Header Assy in different shapes with modern techniques and machinery for domestic, commercial and centrally air-conditioners. 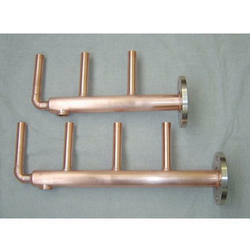 We are offering Copper Header.